Buddhism and science, are they contradictory or compatible? What can Buddhism bring to the modern people? 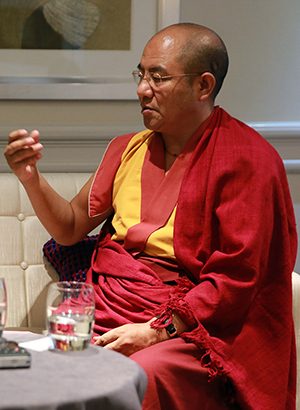 In this conversation regarding Buddhism and science between Khenpo Sodargye, a renowned Tibetan Buddhist master, and Dr. Tuladhar-Douglas, a university professor of Aberdeen, you can find both the research-based narrative of the relationship between the two subjects, and also recommendations of simple yet effective meditation practices for both ordinary people today and university students. As well, being a university scholar and also a Vajrayana practitioner, Dr. Tuladhar-Douglas shares his personal experience of following the tantric tradition, and the biggest change it brings to him. When your meditation reaches certain level, you will be able to meditate anywhere and anytime, either standing, walking, lying down, or sitting. It is a very good thing to offer the teaching on The Way of the Bodhisattva in a university. Some schools in my hometown—the Tibetan area—provide the program to study The Words of My Perfect Teacher and The Way of the Bodhisattva. The students may not feel a big difference within these three or four years. But, after their graduation, as they enter the society and start their careers, their lives show a noticeable difference from that of others. So as a suggestion to university students, I do hope they can endeavor to study The Way of the Bodhisattva. Mipham Rinpoche had many works on medicine, some related writings on astronomy, as well as many treatises on psychology, more of which are on traditional spirituality. For example, on astronomy, he had an extensive commentary on Kalachakra. He also had teachings on calendar calculation, which is a branch of astronomy. Psychology is another big area of his works, more related with our daily life, which also includes some topics related to modern management science. Mipham Rinpoche had a treatise called Code for Kings. It talks about how a king should rule a country, including how to develop economics, how to govern the nation, and how to guide the people to keep their faith and to maintain virtuous conduct, etc. Many of his works are about those topics. Most of Longchenpa’s works talk about the highest level of spirituality—the nature of mind, such as Seven Treasures,The Fourfold Heart Essence, all of them are very profound tantric teachings. Longchenpa also had some writings on history and logic. In regard to cosmology, he held his own distinctive views. Longchenpa’s The Wish Fulfilling Treasury is a very comprehensive treatise that covers many topics. I require my students to study Mipham Rinpoche’s Code for Kings. It integrates both worldly and spiritual teachings, covers many topics, such as modern management science, political science, as well as economics which however is just in a small part of the book. The book is more focused on the management of an entire country including environmental protection, and people’s faith and spirituality, etc. I feel for today’s leaders or managers, it is quite necessary to study this text and to learn about its spirit. As for the most important rituals for ordinary people to practice, I feel stillness meditation can be a good start. Also, for those with some Buddhist background, it is necessary to recite mantras. They can visualize Avalokitesvara or Shakyamuni Buddha in front of them and then recite mantras. They may open their eyes for a while and then just sit there and meditate. For beginners, if they start with this and practice continually, they will be able to maintain a peaceful mind, which is quite essential. Should One Do Meditation in the Daytime or Nighttime? It is a fact that, some special practices of Dzogchen, such as looking into the sky, do require practicing in the day time. However, many other practices, either Mahayana or Tantrayana practices, do not have such restrictions. So it is fine to do your meditation either at night or in daytime. I myself practice in the following way. First, as dharma practitioners, we need to constantly recite mantras and maintain mindfulness. Second, we need to pray. Pray to our deities or gurus in our daily life. Third, we need to do sitting meditation whenever the circumstances allow. I think it makes no difference whether you meditate in the daytime or nighttime. As long as you have the time, you may meditate. When your meditation reaches to certain level, you will be able to meditate anywhere and anytime, either standing, walking, lying down, or sitting. So as a relatively advanced practitioner, it does not matter whether it’s day or night. Whether it be in the East or West, in the day or night, in a crowd or all alone, all of these do not matter when the meditation reaches to certain level. This is a very important point in the practice.